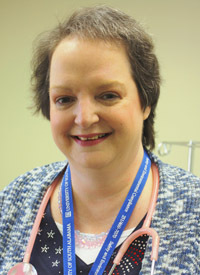 My own cancer treatment journey as a patient wouldn’t have been possible had it not been for all the compassionate caring of my own chemo nurse Wanda Greeley, RN, OCN, of Sacred Heart Cancer Center in Pensacola, Florida. It’s so very important in this fast-paced world to hit the pause button to honor oncology nurses like Wanda who have the passion, dedication, and compassion to help others. This quote exactly describes the kind of professional and personal relationship that Wanda Greeley and I share, dating back to October 2004. 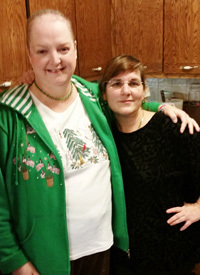 We have worked together for 11 years as chemotherapy nurses and have a rock-solid friendship. In December 2004, Wanda became pregnant with twins, and her mother was diagnosed with stage 4 non–small cell lung cancer. I was there to help support Wanda and her family emotionally and professionally. I became her mother’s chemotherapy nurse for many cycles of paclitaxel/carboplatin in hopes that she would survive long enough to see her twin grandsons’ birth. Unfortunately, her mother lost her battle with cancer in August 2005, just six days prior to the birth of her grandsons, and during the same week that Hurricane Katrina did its damage in our hometown of Pensacola. During that week, I provided friendship and support to Wanda as she buried her mother, gave birth to her twin boys and had a near-death experience during their delivery. We both have been very active in our local Northwest Florida Oncology Nursing Society (ONS) Chapter and have served as chapter officers. Wanda was instrumental in encouraging me to run for chapter officer, and I was elected 2014 President. I am nominating Wanda for an Extraordinary Healer Award because of her strong commitment to me and many other patients needing her care. I was diagnosed with stage IIIC endometrial cancer and went through major cancer surgery in October 2014. Wanda has been instrumental in my recovery, providing me with physical, emotional and spiritual support. Life holds twists and turns for everyone. I administered chemotherapy to Wanda’s mom, and now, more than 10 years later, my special friend and work colleague Wanda took on the daunting task of administering 17 weeks of strong chemotherapy to me, beginning Halloween 2014 and ending in March 2015. I absolutely could not have done this cancer journey without her support, as her faith, care and hard work have helped me to become cancer-free. One of the intravenous chemotherapy medications she gave me, paclitaxel, has its roots as being a part of the Pacific Yew tree’s bark. On Christmas Day 2014, Wanda invited me to join her and her family for their Christmas dinner. So, I exchanged my synthetic tree bark paclitaxel “recipe” she administered to me on Christmas Eve for her real Christmas dinner recipe. After Christmas, she continued to give me my treatments. She was there when I rang the office chemo graduation bell on my last chemo day, March 7, 2015, and we both cried together. She then supported me through three months of radiation oncology treatments and encouraged me as I waited for my CT scan and PET scan results. We then celebrated my cancer-free results. This is my story about Wanda’s devotion and caring, but it has always and does always repeat itself with all of her patients consistently every single day. Rejoice, as there are so many things to be thankful for. Celebrate your everyday blessings and the moments shared together. How do you demonstrate God’s love in your daily life? How has He touched your life? By being a blessing to others. Wanda epitomizes this, to me and to each cancer patient she works with every day.